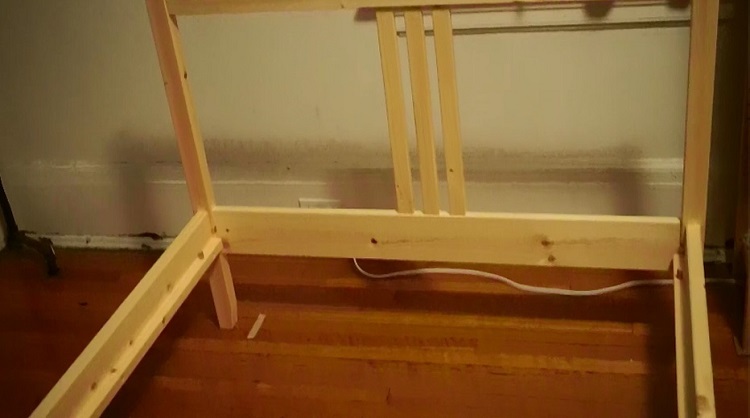 I had never really been happy with an old bed frame since a leg broke in the middle of the night -- this was barely a few months after I bought it. The problem, I think, was that I mounted the legs onto the supporting plates in reverse. Having bought the cheapest bed I could find, it wasn't much to look at even with the legs fixed. So, once the surface treatment started peeling almost a decade later, I started looking for a new bed frame. Who knew you could buy a new one for about CA$ 50? The low price of the FJELLSE and what looked like solid wood construction on the Ikea.ca product page sealed the deal for me. Note that I only purchased the bed frame. A slatted bed base was not included, and I did not purchase one separately because the one from the old bed was being "recycled." Saved about $20, yay me? The most amount of labor that this project demanded was not from putting together the new FJELLSE bed, it was from getting to the point of assembling it. First required was the removal of all the objects surrounding the old bed to clear a working area. Then, the stuff on the bed like the mattress, pillows, blankets, and slatted bed base had to be removed and stored temporarily. This allowed for the old bed to be dismantled and moved. And another hour or two were spent on wiping the floor underneath the bed where years of dust had accumulated. 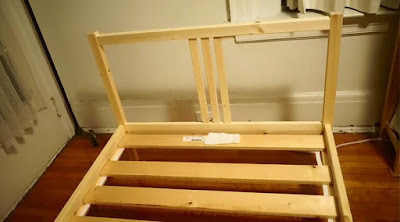 Five hours after I started, I got to the FJELLSE bed frame and put it together in a bit under an hour. There weren't that many screws or parts. 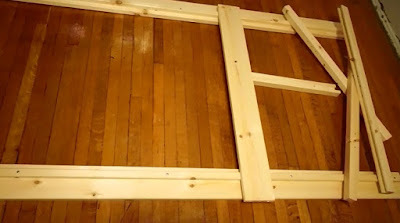 The only trouble I had was lining up and connecting the sides onto the headboard. Instead of screws that went directly into the wood, a metal cylinder with threaded holes was used for some connections. This was initially concerning because I thought it would be a lot of trouble to line the holes up with the screws but it wasn't. Overall, everything went pretty smoothly except for the nearly decade old slatted base I reused. The boards were too large to be used with the dowels on the bed frame -- these dowels appeared to be used to help keep the slatted bed base in place. Looking back, I should have just bought a new slatted bed base for $20 to get things to fit properly. Did I mention that some of the metal screws had a black surface treatment? It shouldn't be a big deal. However, a few months back, I had to take the armrests off my office chair and it used screws that looked like they were painted black. Taking them off left a nice dusting of black particles on the floor -- the bits probably came from the painted metal arm rest around the screw holes, the screw threads, or the screw head. 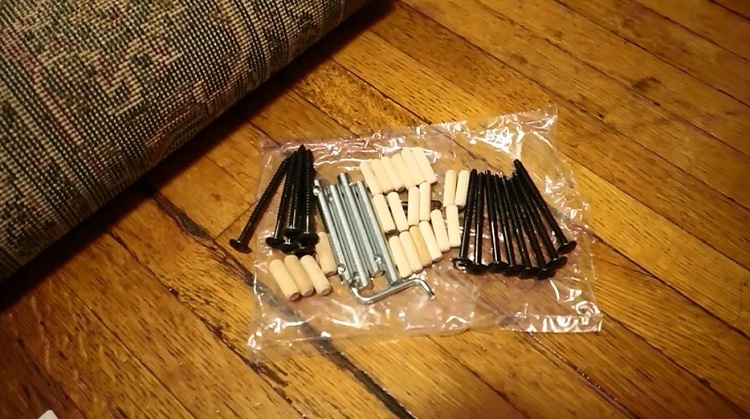 I haven't had to unscrew anything on the FJELLSE bed frame yet so I don't know if it'll leave the same surprise. Maybe it isn't the same stuff because I read about phosphate something finishes on screws. Regardless, hope it doesn't. It just would have been nice to never have to worry about this given how little a difference shiny metal screws would have made in terms of appearance. If the surface treatment was for corrosion resistance or some other function, another option would have been nice. Most of the bed, other than the headboard, was about a foot or less off the ground. I haven't noticed any issues yet. Buy a second FJELLSE for a matching set? And I think I saw a full/double-sized version of the FJELLSE available on the Ikea.ca website. So far so good. It appears to support my weight. 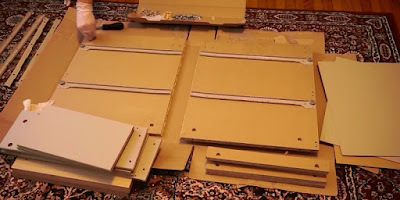 I've been trying my best to only purchase solid wood furniture products lately (e.g. IVAR, HEJNE). The FJELLSE was a nice addition to this collection. No major quality issues jumped out at me and finishing looked pretty good. I didn't notice any excessively rough edges or surfaces, major cracks, or big splinters. For only CA$ 40, I was pretty happy with what I received: a warm looking, well put together piece of furniture. Assembly was pretty straight forward for me and I got it done in a relatively short amount of time without much trouble. Getting the mattress back on was the only harrowing event. Speaking of the mattress, I noticed that the fit on the FJELLSE was tighter than on the old bed. It felt like the twin-sized mattress just fit into the space whereas the old bed had a bit of give on all sides. In terms of general design, I would have preferred not having a headboard because of my habit of ramming my head into the headboard in the middle of the night every so often. No big deal, the pillow was just moved to the other end of the bed. Decided to replace a nearly decade old bed, found the Ikea FJELLSE for CA$ 40 without the slatted bed base, splurged on it, put it together without any major issues, and I'm pretty happy. Update 6-17-2016: Bed is still in very good condition, but I've been pretty gentle with it. The pine smell went away after a month or so. Only complaint was that the FJELLSE seemed to enjoy sliding/rotating on the waxed floor. I managed to fix this by putting some "chocks" (couple layers of masking tape) around the legs. Ikea TARVA Single Bed Frame Impressions: Like a FJELLSE?